I keep two journals; one for cataloging the titles of the books I read and another for making review notes in while I am reading. Although everyone uses the internet as a tool for record-keeping, the old-fashioned side of me likes to have a hard-copies on hand for back-up. There's just something really pleasing about jotting notes down quickly in an attractive journal versus typing notes in my Google G1 phone and transposing them to my book reviews online later. Writing book review notes in my journal is as pleasing to me as I'm sure taking hard-copy Polaroid pictures is for a professional photographer. In a digital age, I just crave some scribing action at times! 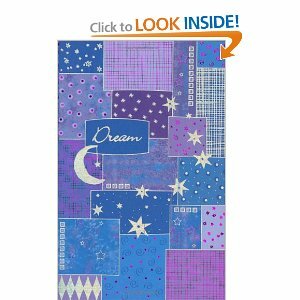 My book-cataloging journal is blue and purple with "Dream " written on the cover surrounded by a crescent moon and stars. It starts with the year 2005 and lists only the names of books and their authors I have completely finished reading. Books I did not finish because I either hated them or thought were boring are not listed. 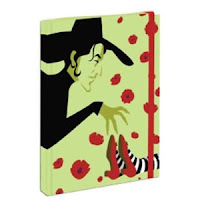 The journal containing my review notes is green and red with a picture of the Wicked Witch of the West from Wizard of Oz ; the green color matching the color of her skin and the red residing in those sleepy poppies. The journal is of the "Wicked " theme inspired by Gregory Maguire. In addition to all things dream-related, my other life-addiction is anything inspired by The Wizard of Oz ! Seeing this journal in the store was love at first site, and I just had to have it. My journals must contain lined pages; with as orderly as I am, I just couldn't stand having journals with unlined paper - Eeek! I highly recommend that aspiring book reviewers visit their local bookstore and pick out the journal that calls out to them. It certainly will help out with your book reviews and make the experience more pleasurable! If you are interested in purchasing either of the journals listed on this page, click on the live links for "Dream " and "Wicked Witch of the West " and both links will take you to the products on Amazon.com. Enjoy!